Dr. Anne Blythe, literary historian, poet, and seventh-generation South Carolinian, lives in a hundred-year-old cabin in the foothills of South Carolina, where her paternal ancestors settled in what is known as "The Dark Corner." 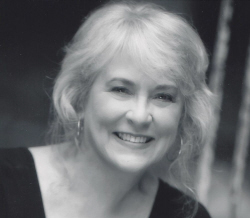 She holds a doctorate in 20th century American Literature with a specialty in Southern and South Carolina writers. She has taught and directed conferences all over the world and has produced television and radio programs for South Carolina Educational TV and Radio. She has published widely on authors such as William Faulkner, Kate Chopin, Marjorie Kinnan Rawlings, William Gilmore Simms, and Elizabeth Allston Pringle. Corridor in Northern Greenville County. Anne has just published her first novel, CAROLINA MOUNTAIN SONG, which follows the struggles and triumphs of three generations of Scots-Irish descendants living in the Carolina mountains. When Tay Ferrell returns to her beloved mountain, little does she expect to become the center of a fierce battle to preserve---or destroy---the land and its heritage. Nor does she expect a compelling figure from her past to hold the long-lost key to her future.